They were flexible in allowing us to keep our car in the parking lot while we visited Trmple Square. They are a stone’s throw from Trmple Square. The apartment was spacious. Comfort of unit with two bedrooms and two bathrooms. Very quiet. The room was great in character and style. I knew it was a studio so with two of us as long as we had a couch, no problem! Spacious kitchen and table. Loved the recliner! Location was close to downtown. Free parking. Easy in and out. The staff was super accommodating! They were extremely nice and worked with us to make our stay convenient and comfortable. The room was clean and comfortable and had everything we needed to make our stay wonderful! I will definitely stay again and recommend The Kimball to friends! I loved that it was a helpful, friendly, and a clean place to stay. Its location can't be beaten. Loved the pillows and dual shower heads. Definitely the best bang for your buck. Location, staff is very friendly and helpful, clean, roomy and has everything you need. Location was very convenient. Good value. Staff was really friendly and helpful. I asked the staff if they could make us a pillow fort, and possibly have pictures of Benedict Cumberbatch. They nailed it. It was awesome. My kids loved it. Had a great time. Perfect location. Would totally do it again. Outdoor parking was a breeze -- open air lot was accommodating to our large SUV + skybox. Lock in a great price for The Kimball at Temple Square – rated 8.9 by recent guests! The Kimball at Temple Square This rating is a reflection of how the property compares to the industry standard when it comes to price, facilities and services available. It's based on a self-evaluation by the property. Use this rating to help choose your stay! A hot tub is on site at this aparthotel. Apartments feature a full living room. The Kimball at Temple Square minutes’ walk away and the Salt Palace Convention Center is 10 minutes' walk from the property. 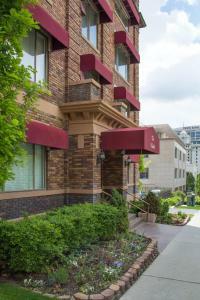 The nonsmoking rooms at The Kimball at Temple Square offer cable TV and a DVD player, a kitchenette, and all linens. Free toiletries and a humidifier are also provided. Laundry facilities are available at The Kimball at Temple Square. Movie rentals and a guest lounge are all offered. Free parking is provided. City Creek Center is less than 10 minutes’ walk from the aparthotel. Clark Planetarium is 5 minutes’ drive away. 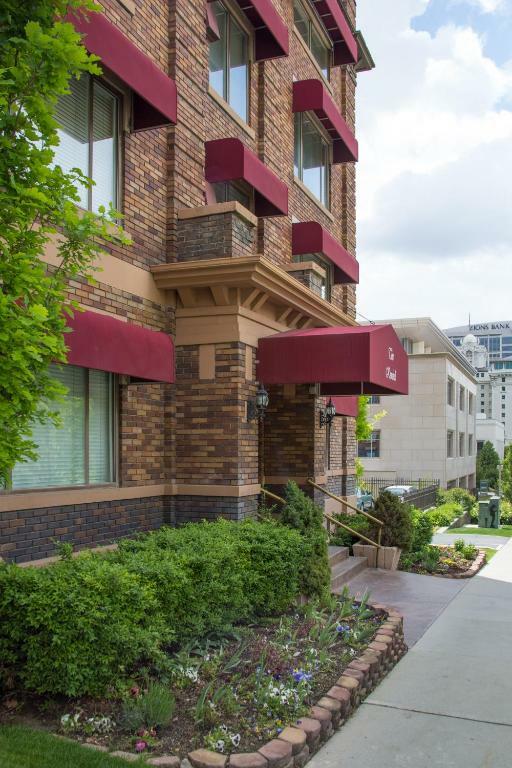 When would you like to stay at The Kimball at Temple Square? This suite includes a bed that pulls down from the wall and a kitchenette. This studio also features cable TV and free WiFi. This apartment features a full kitchen and a living room with a cable TV. Please note that bedding configurations cannot be guaranteed and will be allocated upon check-in. A separate living room with a sofa bed and a fully equipped kitchen are featured in this apartment. Cable TV and free WiFi are also included. This apartment features a living with a cable TV and a full kitchen. This apartment features free WiFi, a cable TV and a kitchenette. There is also a Murphy bed that pulls down from the wall. There is a place for you in Salt Lake City where the old and the new mingle. A place that is as close to culture and commerce as it is to the mountains and lakes. A place among the friendliest people in the west. It's a place called The Kimball. In 1847, pioneers settled here when Brigham Young and first settlers crossed the Rocky Mountains, saw the Valley below and said,This is The Place. A leader among those courageous settlers was our namesake, Heber C. Kimball, the Lieutenant Governor of the new Utah Territory. Kimball settled on a ten-acre block at the City Center where he built his home and successfully planted crops. He was proud of his land and his home, and loved to share it with friends. Kimball's industrious and innovative qualities have endured. These attributes still characterize the city in which Kimball made his home and make Salt Lake City the vibrant community it is today – a place of dynamic energies neatly balanced between its pioneer past and its spirited future. Each unit at The Kimball provides the perfect blend of comfort, elegance and convenience, with all the necessities of home and many little thoughtful details. There is a place for you in Salt Lake City where the old and the new mingle. A place that is as close to culture and commerce as it is to the mountains and lakes. A place among the friendliest people in the west. It's a place called The Kimball. In 1847, pioneers settled here when Brigham Young and first settlers crossed the Rocky Mountains, saw the Valley below and said,This is The Place. A leader among those courageous settlers was our namesake, Heber C. Kimball, the Lieutenant Governor of the new Utah Territory. Kimball settled on a ten-acre block at the City Center where he built his home and successfully planted crops. He was proud of his land and his home, and loved to share it with friends. Kimball's industrious and innovative qualities have endured. These attributes still characterize the city in which Kimball made his home and make Salt Lake City the vibrant community it is today – a place of dynamic energies neatly balanced between its pioneer past and its spirited future. Each unit at The Kimball provides the perfect blend of comfort, elegance and convenience, with all the necessities of home. The renowned Shoppers paradise "City Creek" is located one block away. Check out The expansive Gateway mall, Temple square (across the street! ), Delta Center home of the Utah Jazz and special events. House Rules The Kimball at Temple Square takes special requests – add in the next step! The Kimball at Temple Square accepts these cards and reserves the right to temporarily hold an amount prior to arrival. Please note that the front desk is open from 08:00 until 22:00 Monday through Saturday and Sunday from 08:00 to 17:00. Check-ins are welcome after 15:00. Guests expecting to arrive after 22:00 are asked to use the courtesy phone outside the lobby door for assistance. Please note that the minimum check-in age is 18 years of age. Housekeeping services are available upon request from 10:00 until 14:00. Housekeeping requests must be made at least the night before arrival. Nothing to complain about - all excellent! Mormon Tabernacle Choir on Th. nite. The business centre was good. Disposal didn’t work. Dishwasher hadn’t been emptied. Couldn’t turn off fan over the bed and keep the light on. I liked the deep bathtub, but it may not be easy for some older people to step in and out of. Stairs. Stairs were everywhere. It took me 10 mins to figure out where my room was (248). Couldn’t sleep the first 2 nights as it was very hot and stuffy. Thermostat covered in tape. 3 day talked to clerk who told me the other thermostat was behind the TV. Who knew? When I tried to change it we got cooler, but too cold and it would not go back. Need a new thermostat. Also the floors were sticky(carpets), and no extra toilet paper or tissues or towels. Had to go to the desk and ask. They were very friendly though. Also did not know how to get rid of trash. Had to walk out to the dumpster in the rain. That was not worth the $$ I paid for the rooms. Friends of mine paid for a full service hotel right by the convention center for $550 for the 5 days. My bill was over $800, with no service or food in close proximity. Bed was way past due for change. Why has no one acted on this condition. Couch was well broken in. Facility was nice and convenient. Late arrival was handled well. Quiet area. Furnishings were adequate and generally comfortable. The fitness room was closed until 1:00 pm. We liked that it had a dining room table so we could play games. It’s old. Definitely has that smell other reviews mentioned. The Murphy beds are super uncomfortable (and weird). Sheets were super scratchy.